Before I even set pencil to paper to sketch out stitch patterns I had many concerns about my latest design project. The item goes by many names, baby sleep sack, baby cocoon, baby bunting and the designs are as boundless as the names. It’s not a piece I would choose to design, nonetheless the work of designing it fell into my lap and I need to complete it. While the item goes by many names my research revealed it easily fell into three categories. First up: Uncomfortable. But then I’m not a newborn. And, where’s the diaper? Frankly, I wouldn’t leave a baby without a diaper any longer than it took me to change it. Next up: How did you stuff the baby in there? And, where is the diaper? The final category: Why would you do this to anyone? At that point in my research I would have walked away from the project if it had been only my idea. But I didn’t have that choice. I am designing it for a company. I think it speaks to my resilience in the face of 21st century madness that although the research took me almost a week of looking at pictures like those above, my migraine didn’t start until the fourth day. After 24 hours in a dark, quiet room with a cool cloth on my forehead I went back to researching. I had gotten beyond the questions that had battered my cranium up to then: Why and who are using these items? How are they using them? How do they get the baby inside them? Are they stuffing the child through the hood opening? Babies don’t like things going over their heads. Does anyone use diapers? Are there any out there designed to be used with diapers? What is art and what is child abuse? So my inspiration for the sleep sack I am designing started out with written pages of what I would not include, examples of what I didn’t want it to look like, and examples of how I did not want it to fit. I had a ton of don’t bees and no do bees, which for me was a strange way of beginning a design. Usually the sky is the limit, everything is possible and I scale it down to the elements I really like. When a project is in a negative explanation loop whereby I speak about the project in terms of what it is not or will not be like I am in trouble. I have to intentionally move my talk to what it is to be and what it will be like and how it’s use neatly fits the design like an egg and an egg shell. To do that I research the history of the item through the ages. How past items were constructed, what fibers, hides, cloth, etc were used. I document main use and other uses especially when it crosses cultures. If the item changes with time I track down how and why it changed. Often I find initial design inspiration in the historical background of an item. That’s what happened here with the baby sack. More on it’s history and how I’ve grown to enjoy the making of my own baby sleep sack in my next post. Blizzard, Shawl, Yarn Rascal: Oh What Fun! Yes, it snowed last night. Blizzard conditions. This morning’s dawn was a gentle rosy hue that softened the all white landscape. Snow artistically swept into graceful forms covered the lower third of the door. After two tries, I finally forced open the frozen door and stepped outside to shovel an area for Yarn Rascal. My eyeballs nearly froze, the temperature was so low. I came back in, found my old ski goggles and resumed preparation for Yarn Rascal. The sun is full up now and everything outside sparkles like fine crystal. The below zero temperatures (below -17 Celsius) make everything so crystalline. I am almost delusional enough tempted to break out the camera and search out some good shots. Frankly, I don’t know if the camera will even work in below zero temperatures. And the car, which I didn’t quite get around to winterize, won’t turn over. I’ve been so far down in the weeds with my tech editing work and the Shetland Lace Baby Blanket and Yarn Rascal antics that other things have slid beneath my radar. The Shetland Lace Baby Blanket progresses. It’s construction is from the center out, known in Shetland terminology as a Borders Out design. I love this particular motif called Cat’s Paw. I think it will make a sweet center for a baby shawl. I fiddled around and ended up spacing the motifs farther apart than usual. I also decided to begin and end with a full motif top and bottom, while the sides of the center will have half motifs every other motif row. In addition, I substituted k2tbl (knit 2 through the back loops) for sl 1, k1, psso. It doesn’t make a big difference unless you know to look for it. The picture below shows the motif worked with the sl 1, k1, psso. This is the motif when worked with k2tbl. When dressed (blocked) like the sl 1, k1, psso swatch it will be nicer looking in a tidy kind of way. The skpo was a looser stitch that sometimes made the left side yos noticeably larger than the right. Also, it didn’t always form the neat tight bead-like center I wanted. The k2tbl does the opposite. In fact I need to be mindful each time a yo is followed by k2tbl because it has a tendency to make the yo too small if the tension is too tight. The blue yarn on the bottom is the provisional cast on. Knit 4 rows in waste yarn then join the Shetland Yarn. I tried other provisional cast ons and the results were less than optimal. 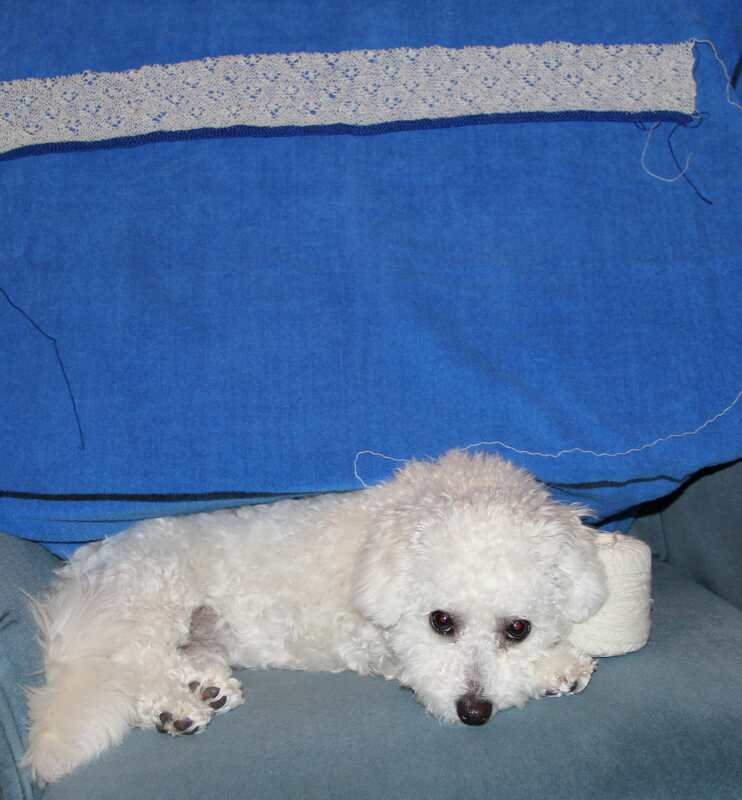 When it comes time to start the borders I will be cutting the waste yarn thread very carefully and picking up the stitches seen here. 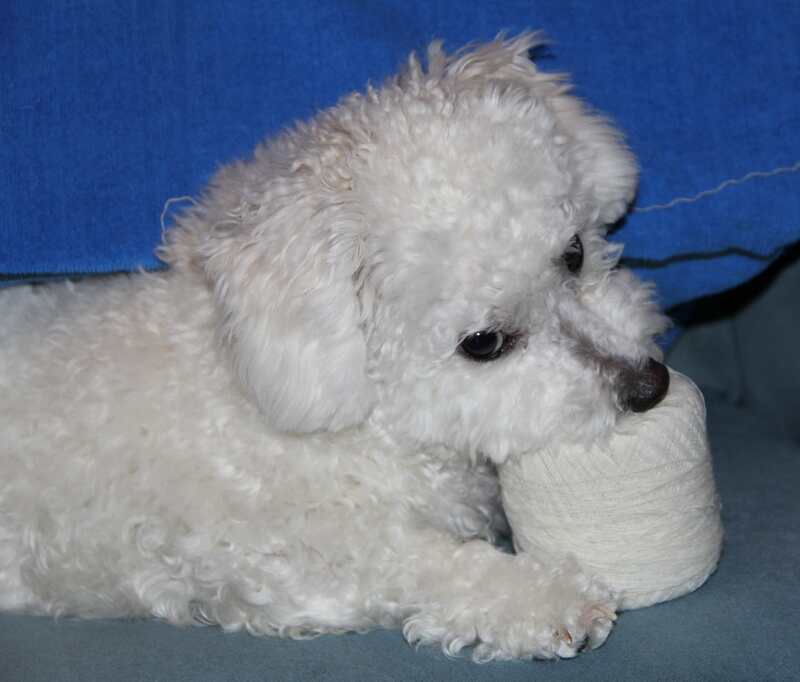 Of course, what would a picture of Shetland Yarn be without it’s most ardent admirer. Yarn Rascal jumped from the bed into the chair as I was photographing the shawl last night. Caught red handed. He just can’t help himself. He is so totally busted. 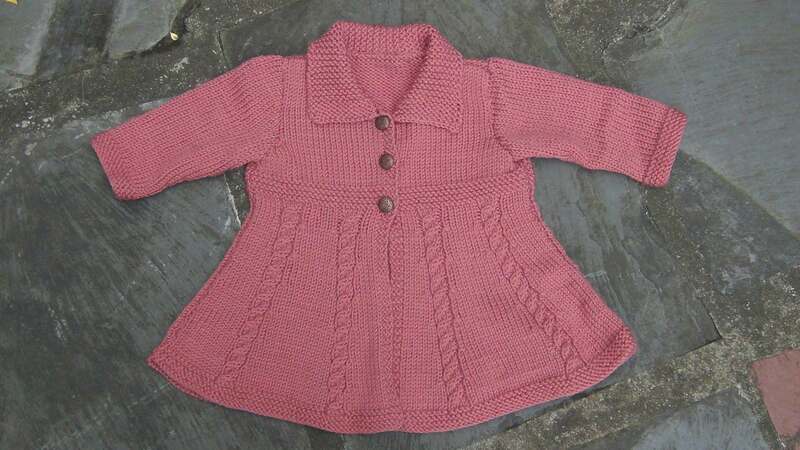 The Victorian Baby Coat is finally complete. While I am pleased with the knitting, I am drop dead crazy over the buttons I found for the coat. They go perfectly. The weather has been less than cooperative, but I decided to take the photos with the camera that hates me anyway. I can see this coat on a little girl with long, curly red hair and freckles on her nose. She is wearing Buster Brown and Tige shoes, and her tights crinkle at her knees. This imagined little girl has stayed with me from the moment I started tech editing the coat to completing the knitting. Rarely do I knit up what I tech edit. But I had to knit this. Today I am going to spend some time with my sketch pad and try to capture her on paper wearing the coat, of course. A question that invariably floats through my thoughts when looking at knitting patterns is what was the inspiration for the piece? Knitting magazines send out mood boards which are usually a collection of photographs intended to create a mood, a unity, for the issue. Sometimes the ideas for my patterns are stirred into being by mood boards I create for myself. Sometimes I look at a yarn and know what it wants to be and what kind of stitch patterns it’s eager to be reconfigured into. These moments of sudden insight are rare occurrences for me. More often it is only after living with a mood board for a time that inspiration comes. And it comes as a whisper. 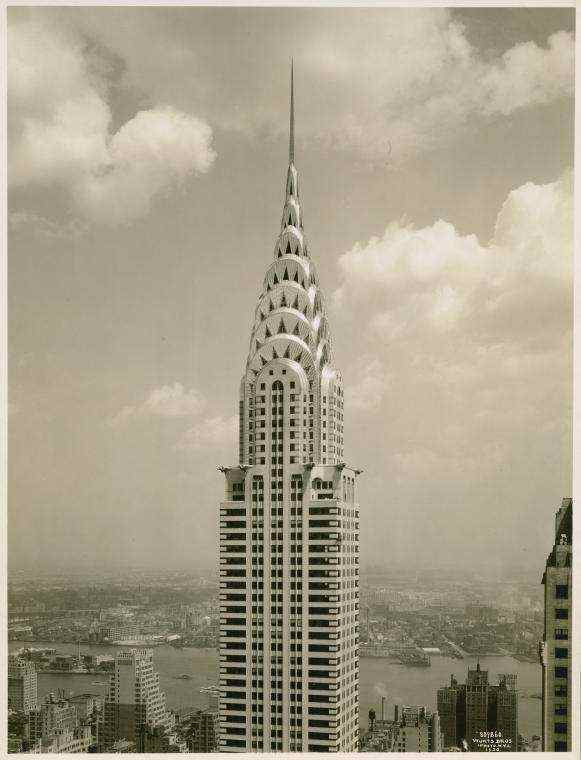 This is the Chrysler Building in New York City. I loved the combination of strong vertical lines with the softness of curves at the top. 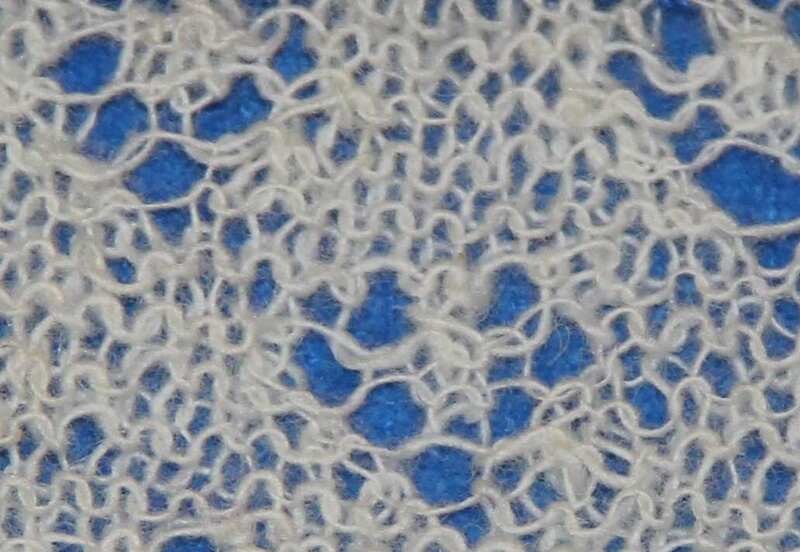 To me, the top whispered lace that gently gathered into scallops. And so the Charlotte baby set was begun in earnest. Sketches were done. Yarns considered, more about this little fiasco later. Colors were collected, another fiasco, but I digress. Before the yarn and color traumas—they are all my fault I must admit—but during the thinking and sketching it occurred to me how much knitting is like good architecture: A well designed knit is affected by the laws of nature and reason, proportion and use. I think the Charlotte baby sweater meets those criteria after all this time. Time has passed since my last post. So many reasons could be given but I think the simplest and most concise will do: Life. None of the time between then (my last post) and now has been wasted. Instead, it has been full of learning, changing, and accepting. My knitting and designs have been influenced in positive ways. 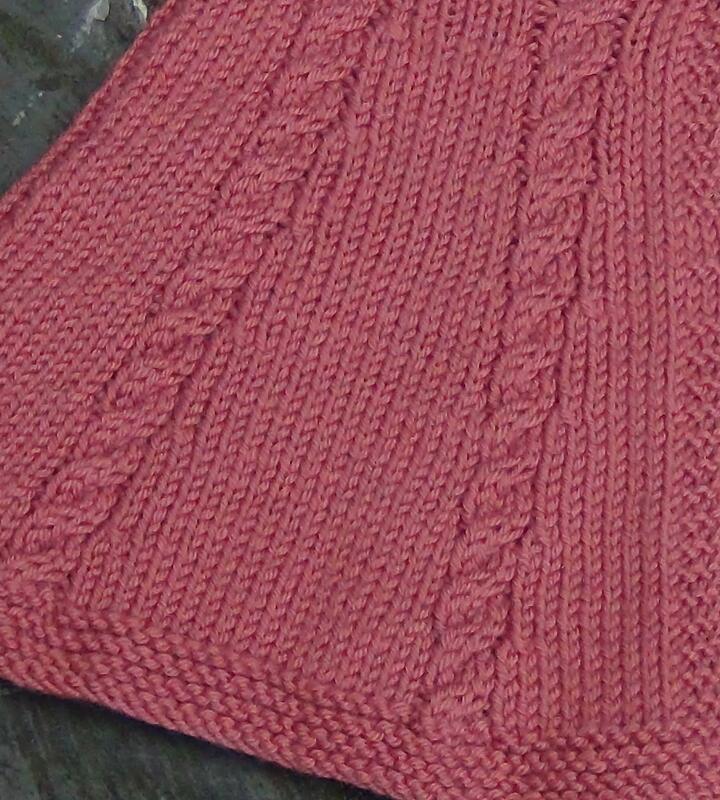 I want to help others experience the sense of accomplishment and deep contentment I feel when a completed knitting project looks good and fits well. Whether it is socks, sweaters, shawls, scarves or whatever it is we choose to knit, I believe we have a right to know all the ins and outs that it takes for us to get there. To this end I am committed. I am working on two baby sweater designs, actually one is a vest for the little man in your life, both of which were inspired by fashions of the 1920’s. More next time. And pictures too. Foot should read: Work even until piece measures 3 inches from the back of the heel or about 1.5 inches less than desired total foot length. “I like to have a plan,” said Mr. Palliser. It’s good to have a plan and wise to keep it flexible when designing. I often start out with a picture in my mind of how I want the knitted piece to look. I follow this with a rough sketch to which I add many notes and collections of ideas. For me, this is a large portion of the design process. The sketch, the notes, every decision or non-decision is as tenuous as a spider’s web in a breeze. All, some or none of the ideas may reach fruition. I have been working on designing a knit sock sized for baby up to adult. A mommy and me kind of project. The design had to be cute enough for a baby girl and at the same time serious enough for an adult woman to wear. 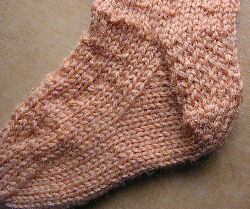 The sock I designed is called Autumn Lace. 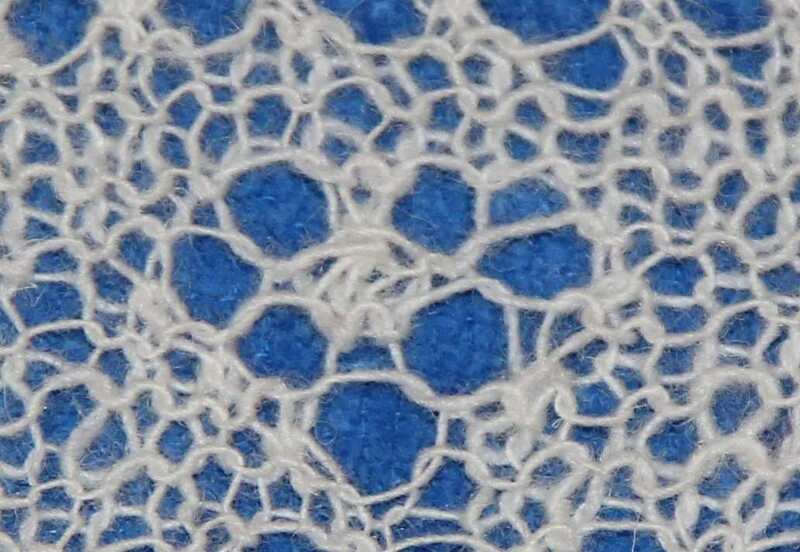 The idea for the sock started with a picture of a lace cuff in my mind. I knew I wanted a solid knitted fabric for the foot. The knitted foot fabric had to be delicate and subtle. 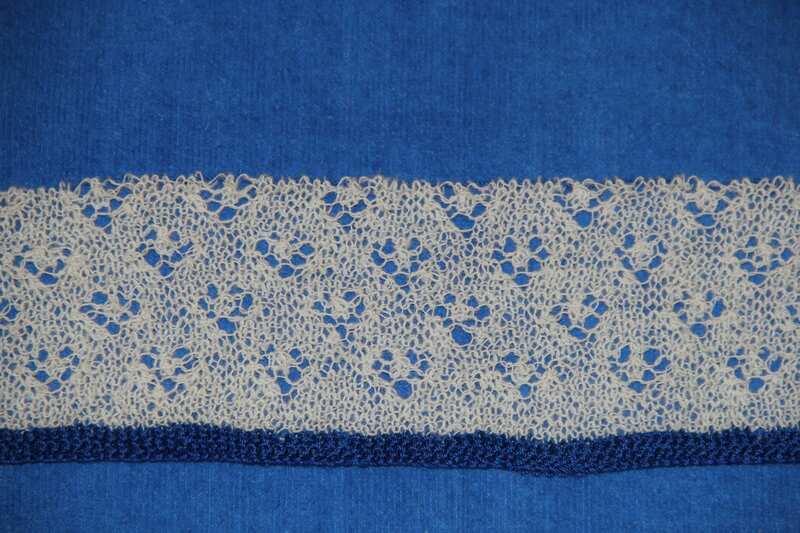 The solid knitted fabric had to fit with the lace of the cuff and not detract from it. I spent well over a month on this part of the design. Searching, swatching, rethinking. What looked okay the day before did not look so good the next. A step forward, two back and one to the side seems to be the dance of design for me. This stage of design can’t be rushed for me. I have to be patient with it. My instinct seems to know when everything goes together and it is time to stop searching, swatching, and rethinking. When the design is right I feel the rightness in my gut and in my bones. I enjoy the knitting. I am peaceful. When I rush this part of the design process, I am uncomfortable with the knitting. I still search, swatch, and rethink in my head. I know I don’t have it right. I feel the wrongness with every stitch. With Autumn Lace, I let the design process dance. While I need to alter the length of the leg portion on the baby sock to bring the lace cuff closer to the ankle, I am pleased with the way the prototype looks. I swatched many lace patterns before I found one that was the right proportion for both a baby size sock and an adult one. I was attracted to the lace pattern because it reminded me of Autumn: the lacey edges of the first ice on the pond, the patterns made by leaves that have fallen to the ground. 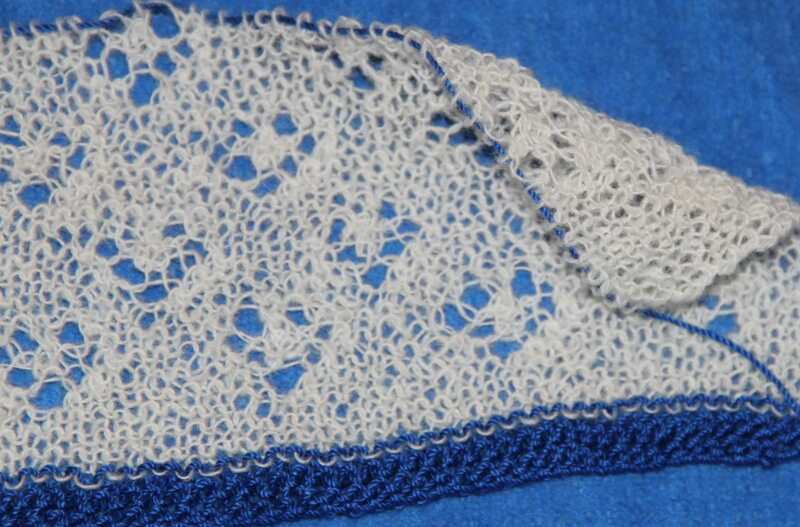 I altered the stitches of the lace pattern for circular knitting and in doing so I feel I have come closer to what I originally saw in my mind. The knitted fabric for the leg and foot, I think, works beautifully with the lace cuff and the shell scallops that border the cuff. The knitted fabric is a simple knit – purl combination that adds visual interest to what would otherwise be a plain stockinette stitch fabric. The knit – purl combination also reminds me of Autumn, particularly the floor of the woods and leaf covered paths with their bumps and ruts. This weekend I hope to complete the adult medium version of the Autumn Lace sock and get started on the reknit of the baby one. I hope you enjoy the weekend.